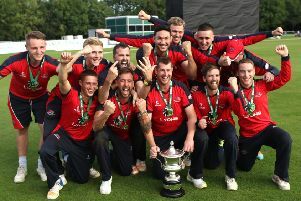 Needing just to avoid defeat to add the three-day championship to the one-day and T20 trophies already won, John Anderson’s men gave a batting masterclass, topped by Dockrell’s timely reminder to the Ireland selectors of his all-round abilities. Resuming this morning on 61-2 chasing the Warriors’ 302 the home side got off to the worst possible start after Craig Young removed skipper Anderson in the very first over without adding to his overnight score of 40. The Bready seamer also accounted for Kevin O’Brien (17) not long after and at 89-4, the follow-on target of 203 was still some way away. Sean Terry and Lorcan Tucker got the reply on track before Sri Lankan spinner Suraj Randiv had Terry caught behind for 28 and then with his very next delivery did for new man Tyrone Kane in the same fashion. That brought Dockrell to the middle and the left-arm spinner was soon taking on Andy McBrine’s team’s attack. He and Tucker added a superb 131 before the latter fell to Ross Allen for 61 (9 fours), but with the Dubliners now just 45 away from the Warriors’ total, the lower order really accelerated. Dockrell went to his hundred with a six and a four off consecutive deliveries from Allen and although the Warriors’ spinner exacted his revenge at the start of his next over, the damage had been done. A final tally of 14 fours and 2 sixes in his 94-ball 101 for the Leinster man ended a brilliant knock and meant the destination of the trophy was now a formality. Yet while that was the case, Anderson was happy to rack up a lead and see if he could knock the North West team over as Eddie Richardson and Max Sorensen provided some great entertainment in the latter stages. This pair added a 69-run stand in little more than 7 overs with Richardson finishing unbeaten on 50 (1 four 2 sixes) while his partner clubbed a 26-ball 45 (5 fours 2 sixes). The lead was 76 with Craig Young (3-89) finishing the most successful of the Warriors’ bowlers although Randiv (2-50) and Allen (2-60) also weighed in. Needing to bat out 24 overs the visitors never looked troubled either if truth be told- Allen with 36 not out and David Rankin (14 not out) seeing them comfortably through to the close on 53-0. All that was left after that was for Niall Franklin from the sponsors, Hanley Energy, to hand the trophy over to skipper Anderson, completing another dominant summer for the winners.